It probably depends where you’re from, but on this side of the Atlantic ‘Khaki’ is a light brown sandy color associated with military (especially British) uniforms. However, we will concede that there is such a thing as ‘khaki green’ even though we think the proper name for this is ‘olive drab’. But maybe Leica has got it right. 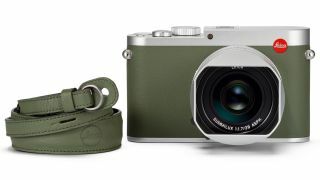 ‘Khaki’ is a much nicer-sounding name, and the colour of the new limited-edition Leica Q Khaki is very pleasing, even if it is green. It’s reminiscent of the 2015 Leica M-P ‘Safari’ edition. And in fact, we like the Leica Q so much it's made it into our list of top 10 best compact cameras. Leica has a long history of special edition cameras, often developed in conjunction with cultural icons like rock legend Lenny Kravitz (Leica M-P Correspondent), artist and photographer Rolf Sachs (Leica M-P “grip”), and fashion label founder Marcus Wainwright (Leica M Monochrom ‘Stealth’ edition). Only 495 of these special edition Leica Q ‘Khaki’ cameras will be made, and they will be finished in premium khaki-coloured real leather trim with the engraved Leica script on the top plate in Khaki too. The same colour is used for a matching leather camera strap. Even the Leica logo is in green! Otherwise, the specs are the same as for the standard Leica Q, which is a full frame compact camera with a fixed Leica Summilux 28mm f/1.7 ASPH. lens and an integrated electronic viewfinder with a resolution of 3.68 million pixels. Wi-Fi is built in and can be used alongside the Leica FOTOS app on a smartphone or tablet. Inside is a 24-megapixel CMOS sensor with an ISO range of 100—50,000 and a pretty impressive 10fps continuous shooting speed, though video is full HD rather than 4K. We like the Leica Q because it’s actually very affordable for a Leica at around £3,700/$4,500 and not bad for a premium full frame camera generally. The Leica Q ‘Khaki’ does cost more, but it’s not ruinously expensive, being listed at £4,150 /$4,995.